Norfolk is only a few feet above sea level. 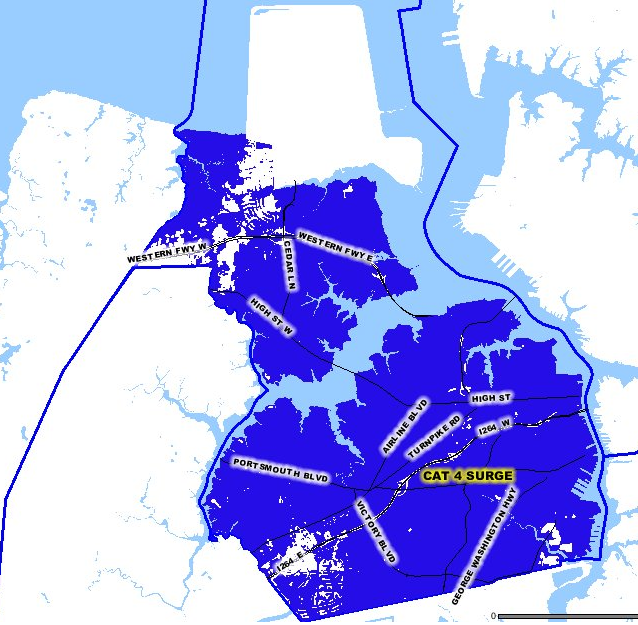 The same is true about the rest of the urbanized Hampton Roads area, including Virginia Beach, Portsmouth, Chesapeake, Suffolk, Hampton, Poquoson, Newport News, and Gloucester. The reservation of the Pamunkey tribe, where Native Americans have lived for at least the last 3,000 years since the Chesapeake Bay reached its current size, is at risk. If current trends continue, the question is not "will Norfolk (and the rest of Hampton Roads) drown?" but "when will Norfolk, Tangier Island, Chincoteague, and other locations near sea level drown - and what should be the response to this threat in coastal areas?" It is unrealistic to expect owners of private property along the shoreline to passively accept that valuable land, houses, and businesses will wash away in the next century and that no action should be taken to protect current infrastructure. When we buy bananas at the store, we don't expect them to last forever - but the American image of land is that it should last forever, and government agencies should respond when natural processes threaten the value of real estate. However, taxpayers living away from the coastal zone may object to subsidizing insurance and disaster relief costs for coastal communities, especially expensive waterfront homes built in areas of known risk. 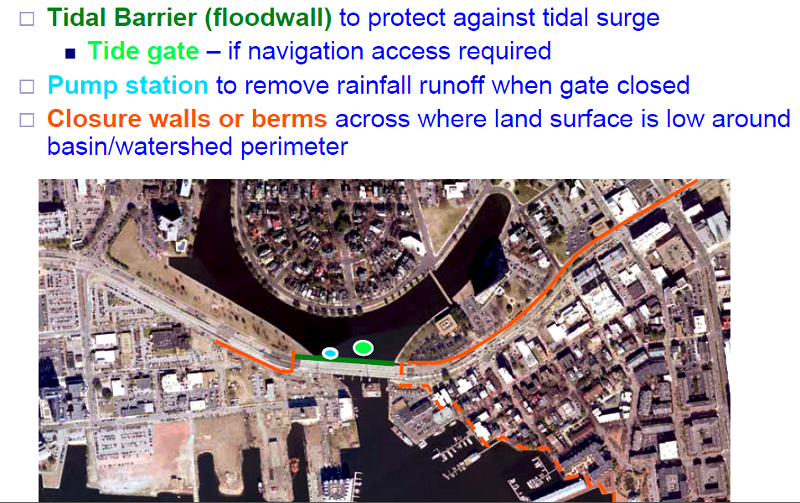 If Federal and state funding will be provided, should it finance seawalls, groins, and other shoreline hardening techniques to mitigate impacts in the next 25-50 years, or should government investments focus now on moving existing structures away from the high-risk areas over the next 100 years? Should local cities/counties that issue building permits require that all new structures near the shoreline must be built even higher that the current National Flood Insurance Program maps mandate, just in case predictions of a speedup in sea level rise (compared to historical rates) comes true? How should government agencies deal with old infrastructure, such as sewers, that are at risk from flooding as sea levels continue to rise? Undeveloped places, such as the Chincoteague National Wildlife Refuge and False Cape State Park, will also be affected. Should places with just plants and animals be sacrificed as the waters rise, so funding can be directed towards urbanized site and shoreline houses? Or should we consciously decide to retreat from the shore,line, removing buildings and converting now-developed parcels into parkland as part of a "managed retreat" strategy over the next 50 years? 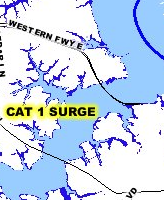 The storm surge from a Category 1 hurricane is projected to cover I-64 on Willoughby Spit, blocking evacuation by car through the Hampton Roads Bridge-Tunnel. Hampton Roads residents will need to be convinced to leave Norfolk/Virginia Beach long before any major storm arrives, if the plans for moving people out of the danger zone are going to succeed. Hurricanes are fueled by warm water, so a Category 5 storm could impact Florida or the Gulf Coast. 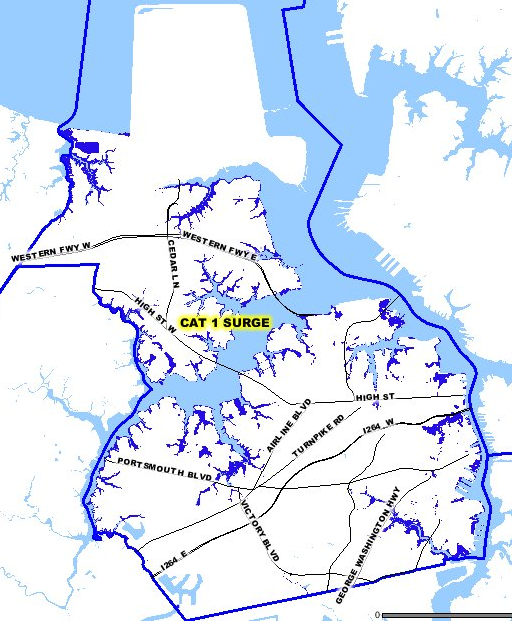 Emergency management professionals do not consider seriously the impact of Category 5 storms hitting Norfolk/Virginia Beach; the Commonwealth of Virginia Storm Surge Inundation Maps only consider Category 1-4 hurricanes. Category 5 hurricanes at Chesapeake Bay are unexpected because of the latitude and the pattern of ocean currents. Hurricanes lose energy as they move north and encounter colder water. Even with the Gulf Stream, the ocean at 36 degrees 30 minutes of latitude (the Virginia-North Carolina border) is too cold for a hurricane to reach Virginia with enough energy to qualify as Category 5. However, climate change could lead to warmer water moving north, which could lead to more-intense hurricanes striking Virginia. Some Category 5 storms hit the Gulf Coast and then move inland to Virginia, such as Hurricane Camille in 1969. The winds drop to tropical storm status as the weather system travels over land from the Gulf of Mexico to Virginia, but the storms can still drop massive amounts of rain and cause death and destruction in the Blue Ridge. In addition to purchasing homeowners insurance, financial institutions that issue mortgages require a high percentage of Hampton Roads homeowners to purchase separate flood insurance policies. Standard homeowners insurance policies cover damage caused by a water pipe break within the house, but do not pay for damage caused by external floods. 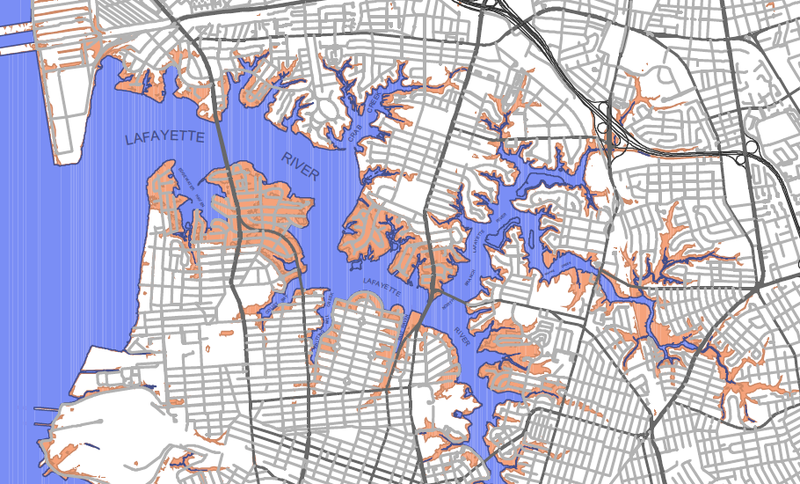 Flood Insurance Rate Maps produced by FEMA define a Special Flood Hazard Area, the area that has a 1% or greater annual chance of flooding (i.e., 100-year flood plain). The cost of a National Flood Insurance Program policy for an individual property is tied to the risk of flooding at that specific location, and the elevation of the structure. Houses receive an Elevation Certificate, determining its height above/below the Base Flood Elevation with a 1% or greater annual chance of flooding. ...the number of floodprone households is estimated to increase from approximately 2.7 million to 5.7 million and 6.8 million by the year 2100 for the 1- foot and 3-foot scenarios, respectively. Assuming current trends of development practice continue, the increase in the expected annual flood damage by the year 2100 for a representative NFIP insured property subject to sea level rise is estimated to increase by 36-58 percent for a 1-foot rise, and by 102-200 percent for a 3-foot rise in sea level. Insurance rates were too low to pay for claims (especially after the hurricanes in 2005, including Katrina), and Congress had to appropriate supplemental funding to bail out the insurance program. 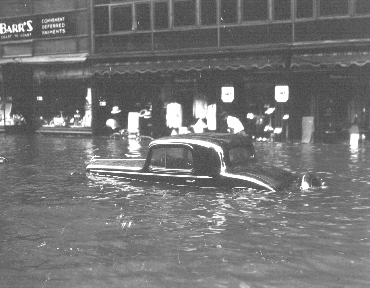 Subsidized insurance reduced the motivation of property owners to move out of high-risk floodzones. In addition, disaster recovery after tropical storms, hurricanes, and other events (such as Superstorm Sandy in 2012) is also funded largely by the Federal government. Low-cost Federal flood insurance and the expectation of "free" Federal funding after a disaster reduced the pressure on homeowners to minimize risk. State/local government officials could encourage development in high-risk areas, since much of future disaster recovery costs would be funded by the Federal government. 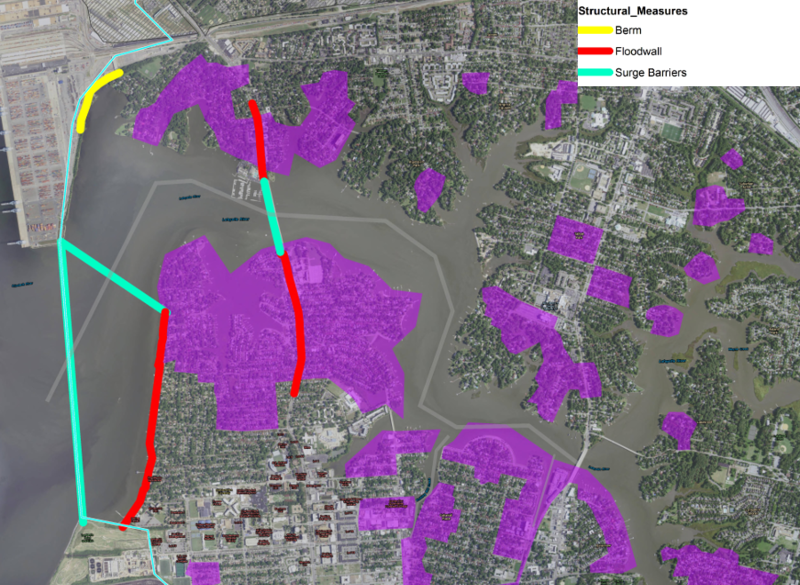 Cities in Hampton Roads could start now and replan/rezone areas at risk, to replace existing structures that might flood with open space (such as ballfields and waterfront parks) over the next 50 years. Reducing density of development in high-risk areas would be expensive, and alter tax revenues. Such a strategy requires either a long-term perspective, or a stimulus of some sort to alter current patterns of development. I saw all the buildings built in the last five years in areas of frequent flooding. How could building permits have been granted for them? The State Corporation Commission, which regulates insurance in Virginia, must ensure insurance companies will be able to pay off all claims if a catastrophe does occur. Insurance companies focus on selected areas, establishing a network of agents and concentrating advertising in particular markets. However, if a "singularity" (such as a hurricane) occurs, then a company could be overwhelmed by the number of claims. It is in the interest of the State of Virginia to have insurance companies hedge their bets, and have only so many policies in one geographic area. To avoid the risk that an insurance company will go bankrupt rather than pay all potential claims, insurers who write many policies in one area will obtain re-insurance, basically buying coverage from other companies. That technique reduces profits, but spreads the risk. While hurricanes may be a low-probability of risk in Hampton Roads, they are not a zero-probability risks. There are three significant threats to Hampton Roads that the insurance companies and banks (as well as government agencies) have to consider: storm surges from hurricanes, sea level rise, and tsunamis. 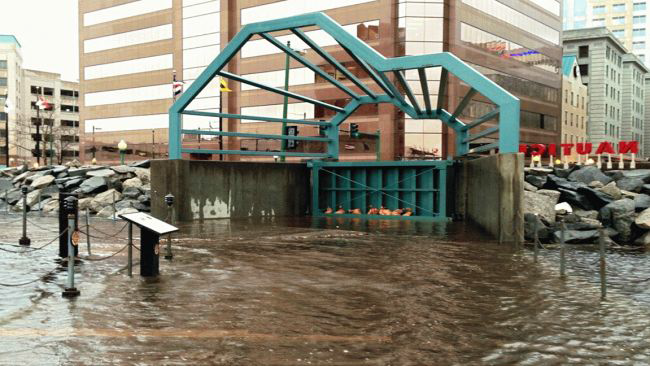 Massive rainfall from a storm can overwhelm the stormwater management systems in urbanized areas, as Hurricane Floyd demonstrated in 1999 when it swamped the city of Franklin and tropical storm Gaston did to Richmond's Shockoe Valley in 2004. 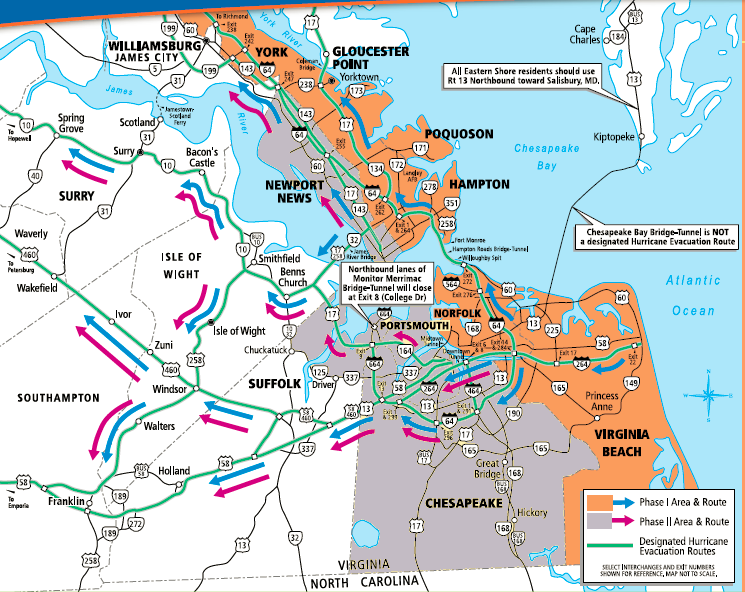 In 2003, winds from Hurricane Isabel wrecked utility systems throughout the Coastal Plain of Virginia, leaving some people without electricity for two weeks. 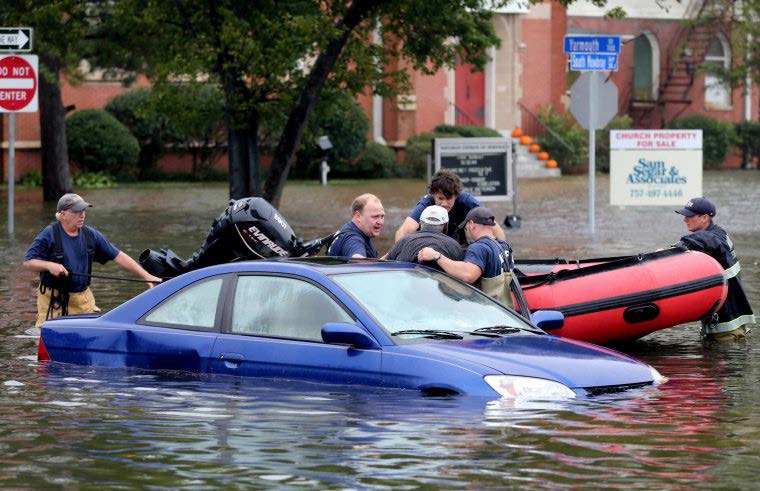 In 2011, Hurricane Irene blasted Hampton Roads, Richmond, and Northern Virginia east of I-95. But inevitably, one is headed into the Chesapeake Bay. To prepare for evacuation, the state has designated hurricane evacuation routes for getting people out of the Hampton Roads area. 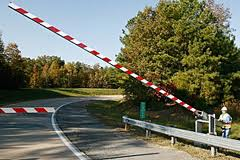 The evacuation plan requires reversing eastbound I-64 to double the number of escape lanes headed west; there are gates on all interchanges between the high ground east of Williamsburg (I-295) and Hampton. 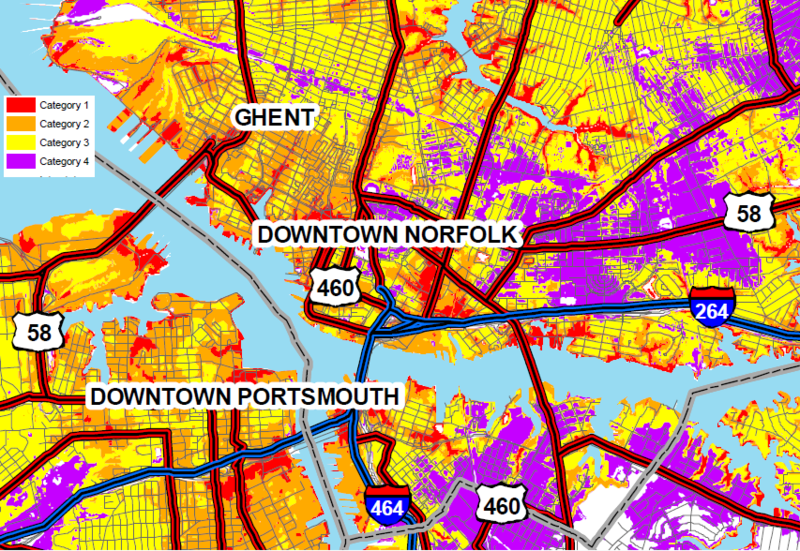 Sea level rise poses the greatest, long-term threat to Norfolk. At various times, the Atlantic Ocean has been higher and Norfolk has been underwater - that's why there are whale fossils from the Miocene Period found in sand/gravel deposits on the Coastal Plain. Since the end of the last ice age, the shoreline of Virginia has moved westward as the Atlantic Ocean has expanded and covered the continental shelf. The Native Americans who first settled Virginia camped on a different Atlantic Ocean coastline during their hunting and gathering expeditions. Their first campsites are probably 30-50 miles offshore now, under 100 feet of saltwater and recent sediments. In all my years of shoreline surveys I have never seen a 17th, 18th, or 19th century domestic site beneath a covering of tidal marsh peat. I think people are mistaking shoreline erosion and land loss, caused by wind and water chewing away at unconsolidated terrestrial sediments, with sea level rise. ...It is important to remember that sediment erosion along shorelines does not equate to sea level rise and sediment accretion along shorelines does not equate to a sea level fall. 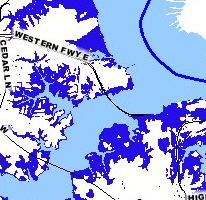 The City of Poquoson is another Virginia jurisdiction that might have to be abandoned, if sea level does rise three feet in the next 100 years. 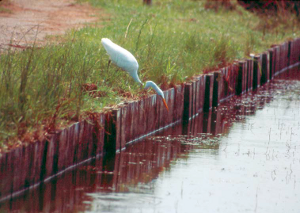 Poquoson's Multi-Hazard Mitigation Plan, when updated in 2009, acknowledged the risk. 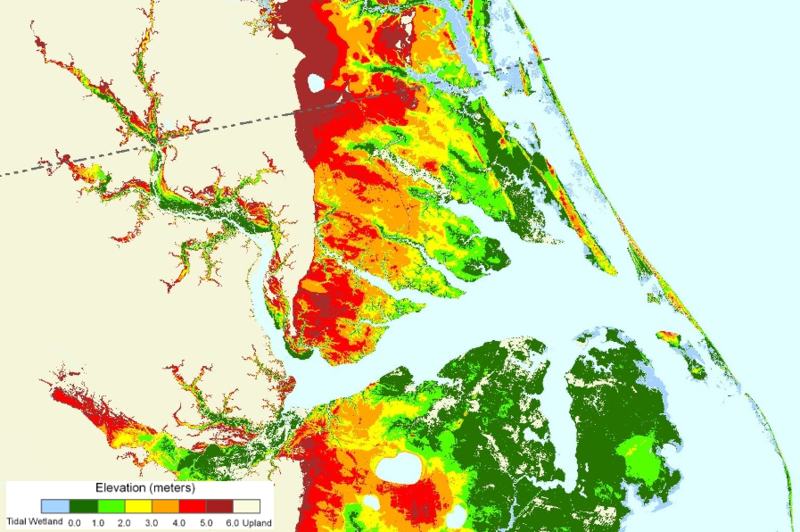 While the science and measurement of tides, storm tides and water levels indicates that sea level is rising in the southern Chesapeake Bay, the potential impacts are realized more clearly when a particular historical storm is examined in greater detail. The Ash Wednesday Storm of 1962 produced a peak storm tide of approximately 7.2 feet mean lower low water (MLLW) at Sewell�s Point (see Figure 11). 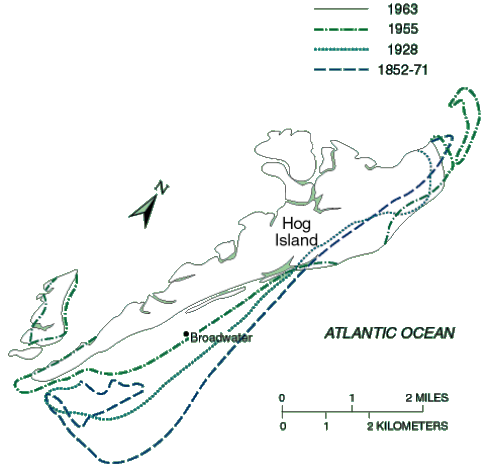 If that same storm were to occur at mean high tide in 2030, using the sea level rise rates calculated above for Sewell�s Point, the astronomical tide would be approximately one foot higher. Since the storm tide is obtained by adding the storm surge to the astronomical tide, the same storm could then produce a storm tide of over 8 feet MLLW. By comparison, Hurricane Isabel in 2003 produced a storm tide of 7.887 feet MLLW and caused an immense amount of damage. Let�s assume that a mid-range estimate of a 3.7-foot higher sea level is correct for 2100. Vast areas of the region will be inundated with water unless a massive dike and levee system is developed to prevent such flooding. Most of the land east of highway U.S. 17 could be covered with water. 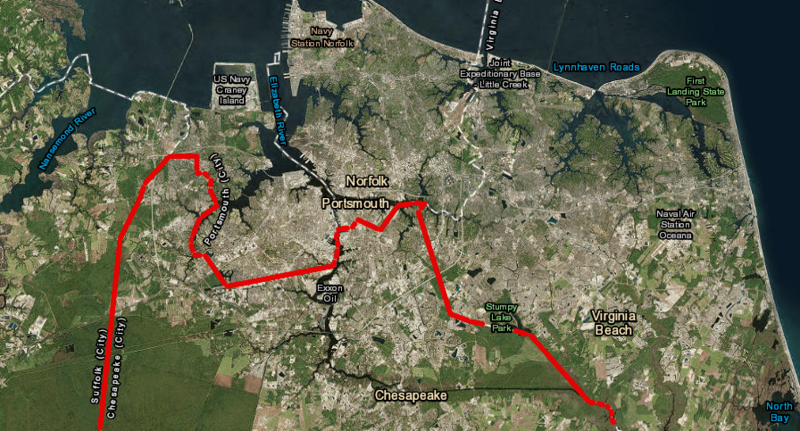 A sea wall to protect key portions of Norfolk would cost about $1 billion. 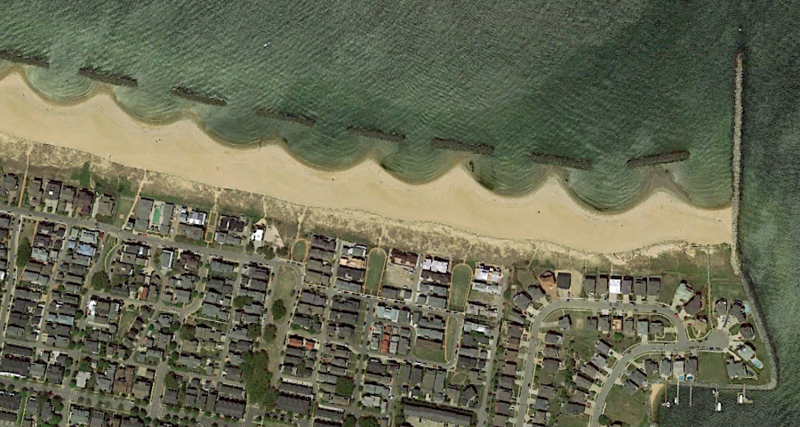 A sea wall for Virginia Beach would be less suitable, since the city's tourist business is based on access to a sandy beach. A levee or barrier on the current dune line might limit future storm damage to structures along Atlantic Avenue, but hardening the shoreline would block the beach from migrating naturally and eventually eliminate the wide beach as sea levels rise. 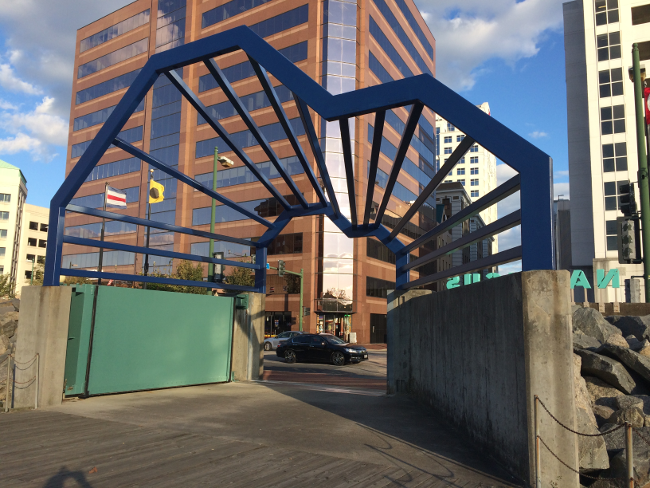 Virginia Beach is caught on the horns of a dilemma. If it ignores rising sea levels, then in the space of a few decades, its beaches will be eaten away and major physical assets such as hotels and restaurants will be damaged or destroyed. On the other hand, if it directly addresses rising sea levels by means other than sand replenishment, then it likely will make its beaches less attractive and progressively damage itself economically speaking. Beach replenishment is only a short-term solution for Virginia Beach. Within 100 years, assuming sea level keeps rising as predicted, the current location of the sandy beach will be completely underwater and the shoreline will have moved west. The City of Virginia Beach has the option of "strategic retreat," sacrificing the developed areas along the shoreline and removing the hotels along Atlantic Avenue to allow the beach to migrate naturally. As sea levels keep rising, the city could remove the next block of developed property along Pacific Avenue and the new shoreline. 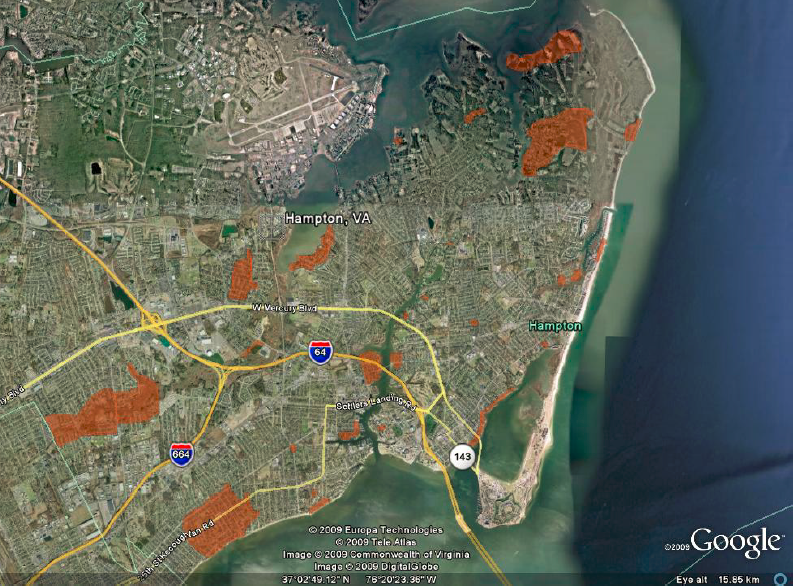 Within Virginia, the jurisdictions with the greatest number of acres at risk from sea level rise are Accomack County, City of Virginia Beach, and Northampton County - not surprising, considering their location and size. 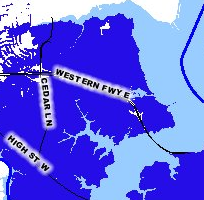 Other jurisdictions in Hampton Roads, and counties on the Peninsula/Middle Peninsula/Northern Neck, may be equally exposed to flooding, but are smaller in area. 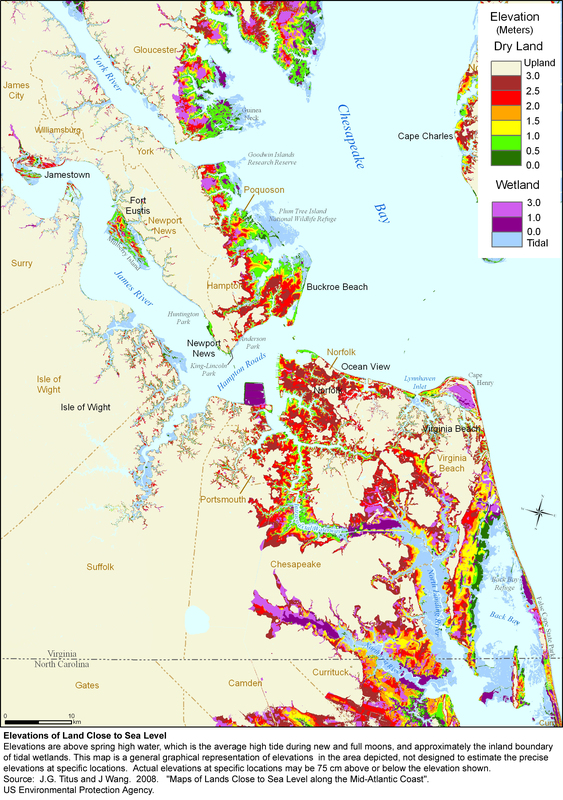 Within Virginia, there are 140 square miles of dry land within 1 meter of sea level, over half of which has already been developed. 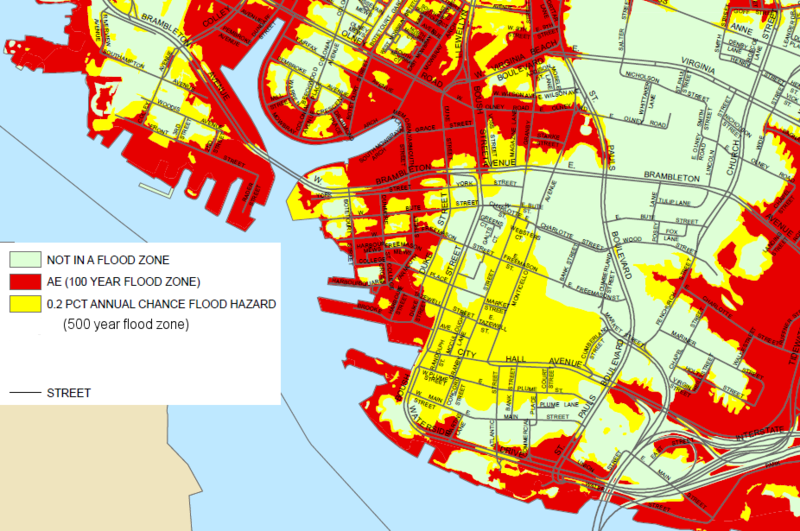 In Portsmouth, 80-90% of the city would be underwater if a Category 3 hurricane struck. There are also 55 square miles of non-tidal wetlands and 625 square miles of tidal wetlands, which provide environmental values but are not likely to be protected from sea level rise. Asking landowners to adopt the strategic retreat approach to rising sea levels is politically risky. 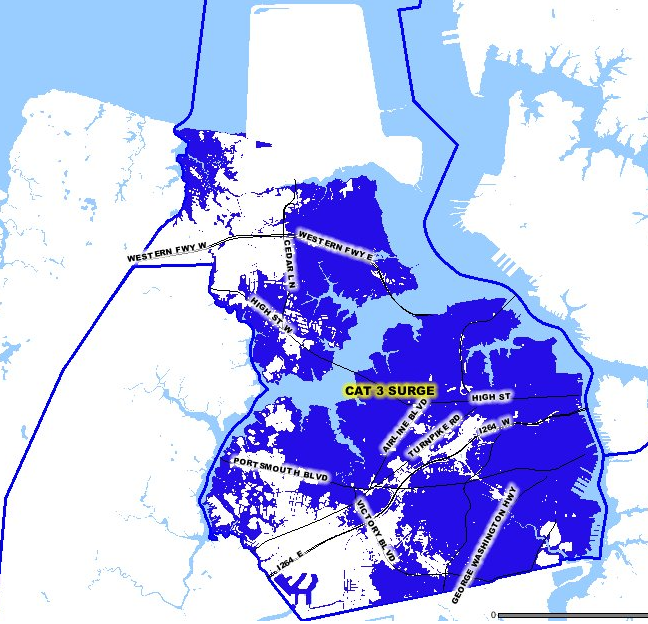 No one wants to abandon developed areas, whether the investment in housing/infrastructure is located on rural Tangier Island or in urbanized Hampton Roads. Politicians win elections by promising to solve problems. Few candidates will generate substantial campaign funds by telling business leaders to abandon their resort infrastructure at Virginia Beach, and allow other landowners further inland to become high-value waterfront property - at least briefly. I can�t think about five feet. What do you want me to do, move the whole city? "Doing nothing" is easy. When The Tide light-rail system was built, it was not elevated in any way to account for projected changes in sea level. "Doing something" that would a real impact on future flooding will be expensive. It would be political suicide to ask voters to raise taxes by $1 billion to fund barriers to delay the impacts of 5-7 feet in sea level rise. The higher taxes would be incurred now, and the benefits would be spread over the next century. 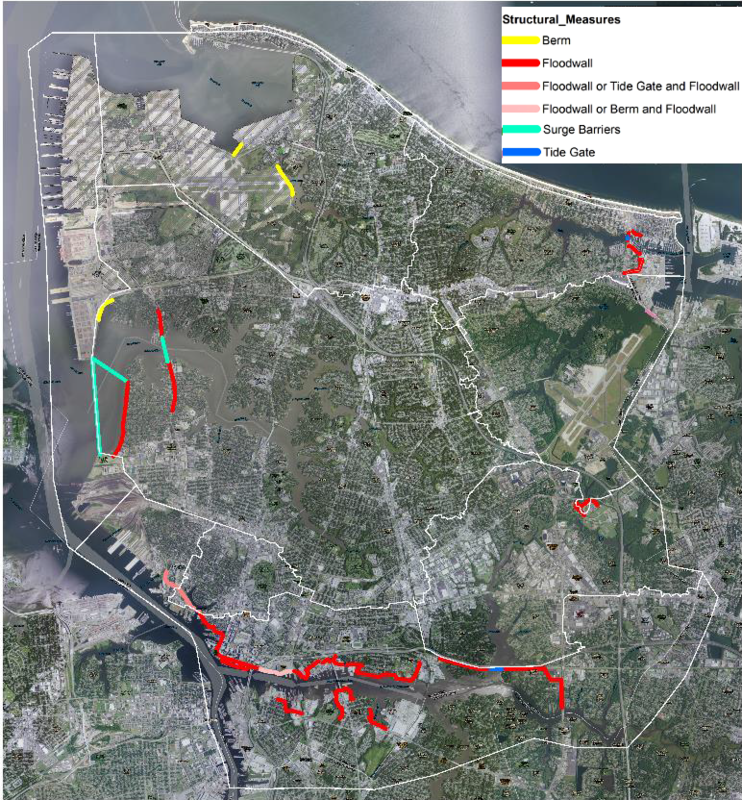 After Hurricane Sandy in October 2012, the U.S. Army Corps of Engineers identified nine high risk areas on the Atlantic Coast for future flooding. Norfolk was one of the nine. 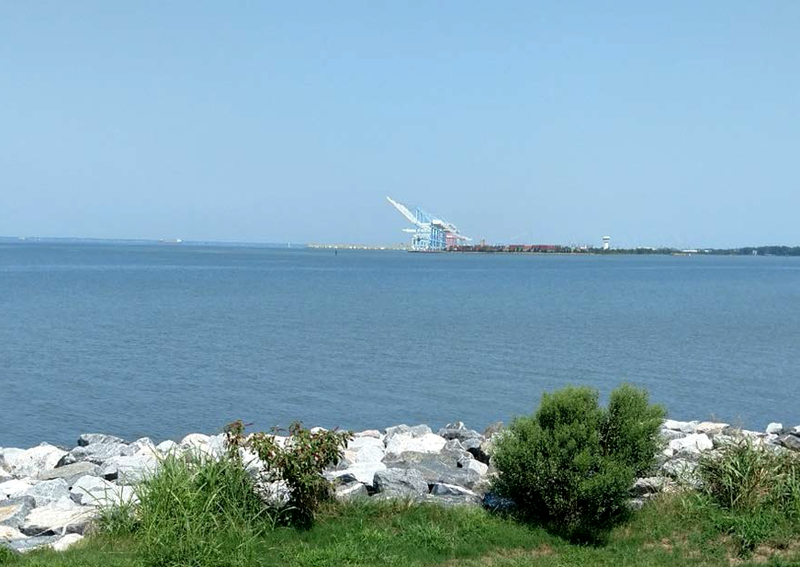 In preparing a coastal storm risk management study, the U.S. Army Corps of Engineers estimated in 2017 that Norfolk would need to spend over $1.8 billion to protect its 63,000 structures over the next 50 years. Among the proposed projects was an extension of the floodwall at Town Point north to West Ghent and east through Harbor Park to Grandy Village. Norfolk is preparing for both adaptation and strategic retreat. 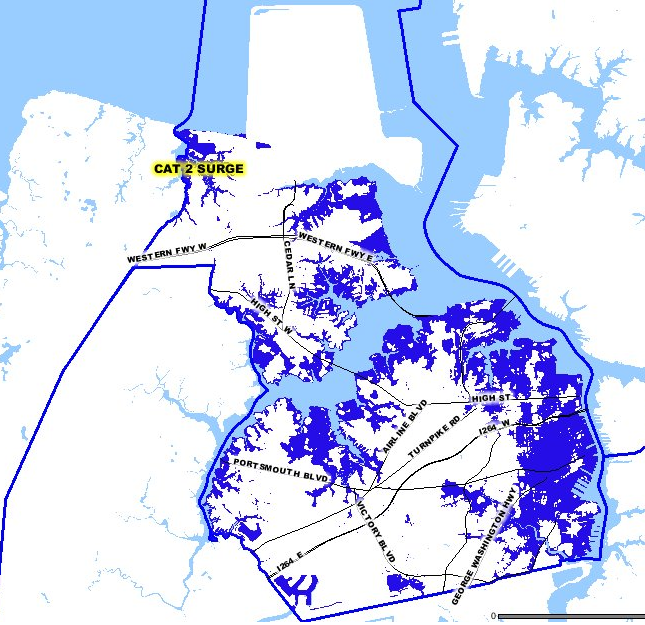 The city is identifying neighborhoods along the Lafayette River that could be abandoned rather than protected by seawalls, and considering using city funds to purchase and destroy 20 homes near Norfolk State University. 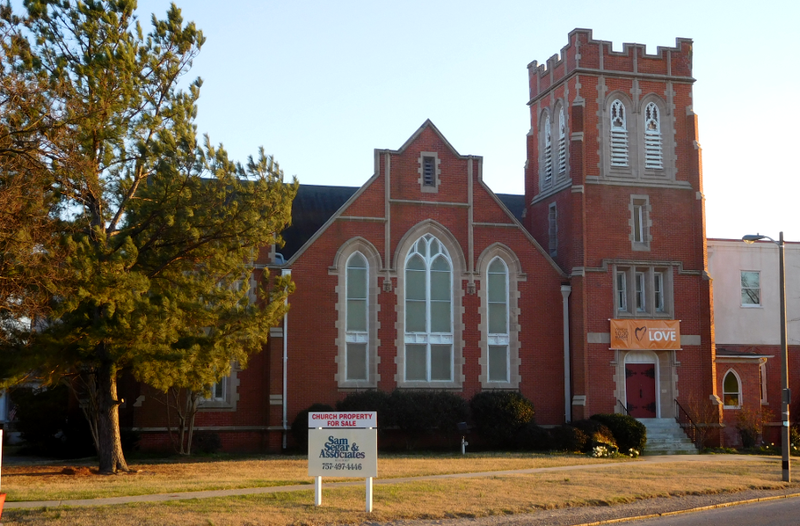 One church in the Ghent neighborhood was affected so often by high water that it added a link on its website to tidal flooding reports, and finally sold the building to move to higher ground. If we fix the problems here, we can sell the solution to Savannah when they start getting a little wet. Miami Beach is already tackling the challenge, raising stormwater fees and installing 60 underground pumps to move floodwaters out of the city into Biscayne Bay. 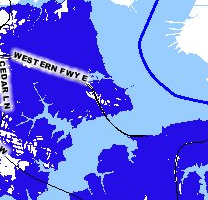 Increasing flooding during high tides (known locally as "king tides") was a major issue in the 2013 election for mayor. The storm drains were designed to carry rainwater from the land to Biscayne Bay, but were operating as two-way channels and transporting the bay's water during king tides to flood streets and low-lying sections of Miami Beach. Some people get swept into office... I always say I got floated in. Proposed responses to predictions of sea level rise propose a dramatic shift in how government agencies spend tax dollars and regulate development. Owners of shoreline and low-lying private property will be affected the most. We were really surprised when we first did the analysis that Virginia Beach didn't have more flooding... But, in a lot of models, we've consistently seen that the baysides or the tidal flooding areas more inland are more apt to flood and to impact property owners near those bays than actual coastal flooding off the ocean. There is intense debate about proposed responses to deal with sea level rise, and even the need to take action now. North Carolina has offered an alternative to strategic retreat or expensive investment. In the coastal region, landowners and local officials recommended that the state should reject predictions that sea level will rise significantly. Twenty North Carolina communities banded together into the NC-20 coalition to oppose efforts by North Carolina officials to require preparations for a predicted 1-meter (39-inch) rise in sea level by 2021, as predicted by the North Carolina Coastal Resources Commission's Science Panel. County officials feared state floodplain maps would be revised, requiring new roads/sewers/bridges to be constructed at higher elevations. 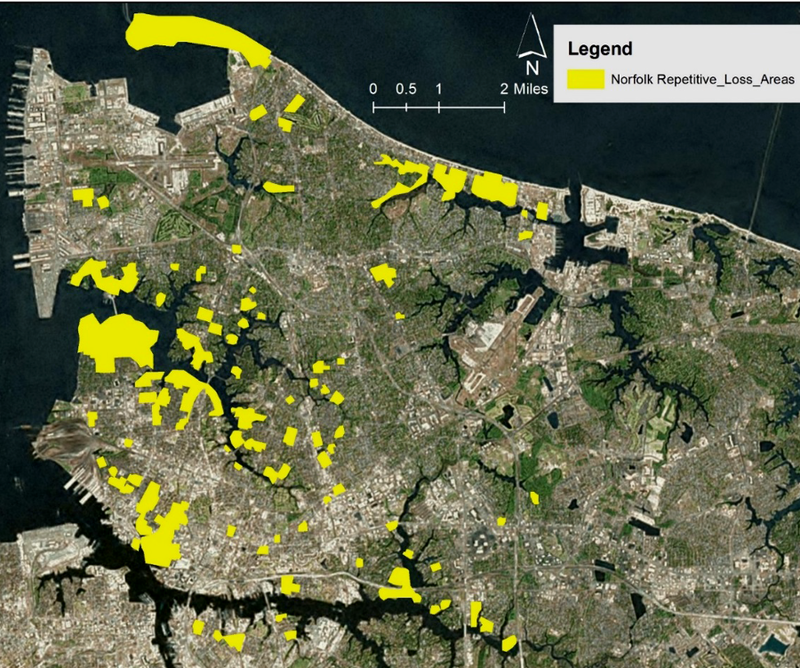 The building industry feared revised maps would constrain new development on low-lying land. The NC-20 coalition proposed that the Science Panel was wrong; assumptions about an increasing rate of sea level rise as glaciers melt were based on global warming scenarios that should be rejected. 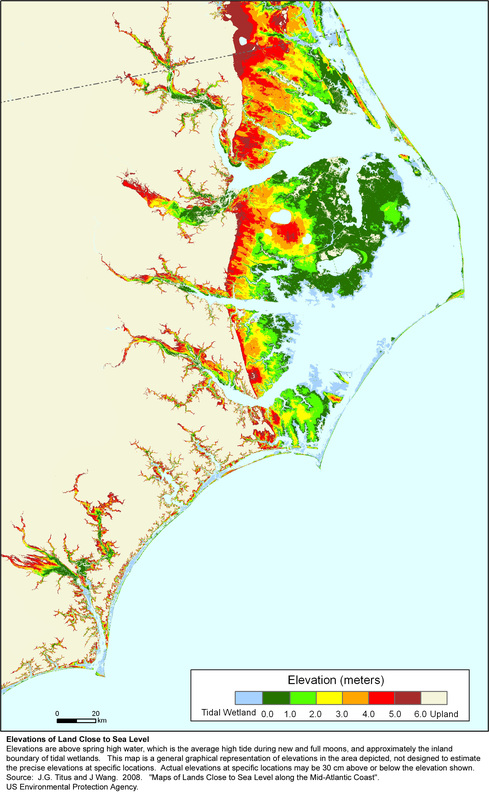 The coalition leaders conceded that sea level will rise, but disputed the rate - including the concept that Cape Hatteras marks the southern boundary of a "hotspot" with accelerated sea level rise, as ocean currents shift. If insurance companies and government agencies in North Carolina make decisions based on predictions of sea level rise, current coastal area property values could be reduced dramatically over a wide area. To avoid considering the risk, the coalition claimed that the historical rate of sea level rise should be used to assume no more than an 8-inch increase in the next century. Developers and North Carolina officials may have propped up land values temporarily, but the legislation will not alter how far the sea level actually changes. If the US Congress required 100% risk-based premiums for properties receiving insurance coverage through the National Flood Insurance Program, or if a major storm results in real-world flooding along the North Carolina coast, buyers may look beyond the NC-20 approach before etermining what prices to offer when buying property at risk of flooding. The law only affected official North Carolina reporting, and information from other sources regarding threats of flooding is readily available. For families interested in buying property that might be owned by future generations, Federal and non-government sources also can predict sea level rise and flooding risks for time periods longer than the next 30 years. 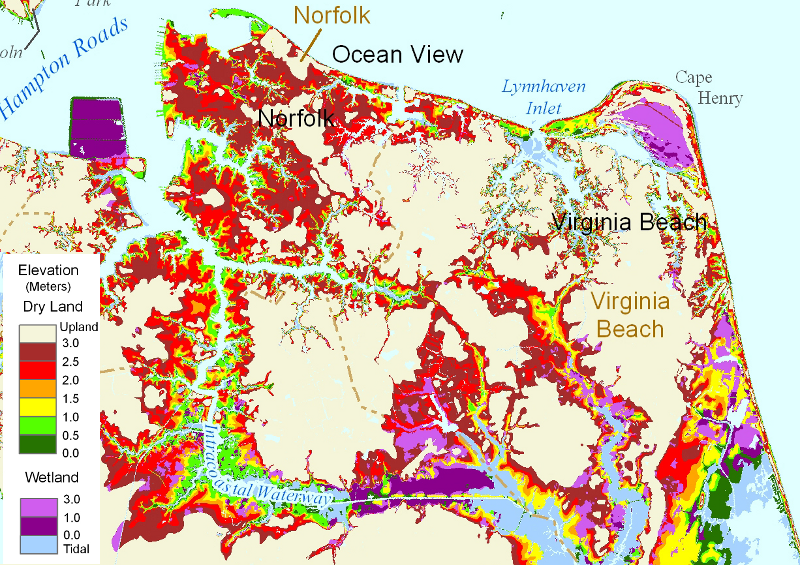 If predictions of accelerating sea level rise come true, Norfolk will be abandoned or sea walls will surround it and the Coastal Plain will be flooded further inland. At the 500th anniversary of the English colonial settlement at Jamestown, the historic old capital of Virginia might be a barrier island, a mud flat, or fish habitat - and the ruins of Norfolk could lie underneath sediments accumulating on the continental shelf. It'll be a hole in the ground, or a hole in water with an old fort and a well at the bottom of it. Despite predictions of sea level rise, banks continue to grant 30-year mortgages and public officials continue to construct new infrastructure within the area predicted to be underwater within the next century. No one has repeated the dedication given by a local Dorchester County (Maryland) official in 1980. Father, today we are gathered here to dedicate a bridge that is a monument to man�s stupidity, a monument to man�s waste, a monument to government interference and inefficiency. For there is no need for such an elaborate structure as this... Our great Creator and Father bless this bridge, and those who will use this structure to meet their needs, knowing that wind and wave and tide are daily at work destroying that which has been built. with Orrin Pilkey's assessment that "seas will rise at least 3 feet in this century and that, for coastal management purposes, a rise of 7 feet (2 meters) should be utilized for planning major infrastructure"